Validation Code cannot be blank. Last Name or Company Name cannot be blank. 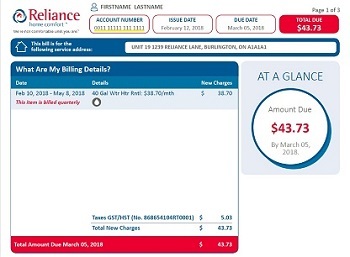 To create a myReliance account, please enter your 16-digit Reliance™ account number, as well as the last name or company name as it appears on your bill. Account Number Account number is 16 numerical digits in length. You can find your account number at the top of your bill as shown below. Last Name or Company Name You can find your last name at the top of your bill as shown below.